Managing and maintaining a small fleet is like herding cats. With a dog. You have so many issues to deal with. Not the least of which is juggling service needs while keeping customers on schedule. Whether you perform some of your service in-shop or depend entirely on outside vendors that alone is a full-time job. You need a web-based service manager to handle all the details: FleetCheck, the affordable fleet maintenance management solution from TMW. Starting with our industry-leading TMT Fleet Maintenance solution for large fleets, we stripped out the features small fleets don’t need.The result is TMW FleetCheck, the budget-friendly, user-friendly maintenance management solution specially designed for truck fleets with less than 150 units. 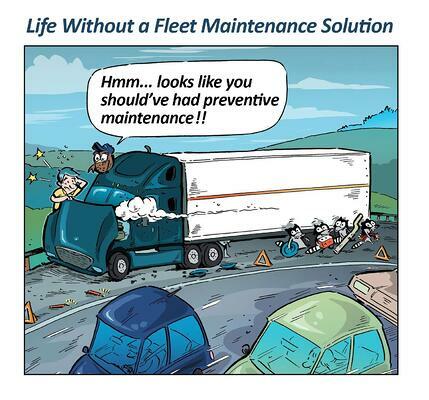 Hosted in the cloud, TMW FleetCheck gives you TMT Fleet Maintenance functionality using your existing infrastructure. This central electronic depository consolidates all maintenance and service functions, both in-shop and outside-vendor. It manages a complete service history of every fleet asset in real time. Cost is based on the number of units loaded into the system. Five trucks today, 20 trucks tomorrow, 150 trucks down the road, TMW FleetCheck keeps you organized as you grow. Unlike conventional systems that aren’t scalable, forcing costly platform changes, powerful FleetCheck is cloud-based. Applications are web-enabled and accessible by laptop or via hotspot. Standardized options and codes and data import templates are built on an open platform. TMW FleetCheck functions as if installed on a laptop. All data is populated in the system, giving you a window into every detail. You not only have full reporting flexibility, you can configure the system to assign access by user group. Vendor documents can be manually entered into FleetCheck. Then you can run reports by vendor, asset, cost per mile, cost per unit or other metrics. The system issues alerts based on your input and schedules follow-up maintenance based on the alerts. The extensive reporting capabilities of TMW FleetCheck enable you to track, analyze and manage a full range of key functions in real time. Fleets over 50 units must document maintenance and inspections for compliance and show where records reside. Compliance has many forms. DOT regulations, which vary state by state. Vocational inspections, which vary by use. And federal safety inspections, which vary by class. Warranty recovery is another consideration. Vendors often require documentation to support warranty claims for reimbursement. TMW FleetCheck stores all documentation and tracks all due dates. System alerts ensure that DOT registrations are renewed on time and inspections are completed on schedule. When needed, up-to-date compliance reports are just a keystroke away. Confirmation can be pulled up on-screen, then printed or emailed. With TMW FleetCheck, you can better manage all the key performance metrics that impact profitability. The payoff is reduced asset downtime, improved operating efficiency and measurable cost recovery. To get in touch with a knowledgeable representative on how TMW FleetCheck can streamline your fleet maintenance management, click here.